The tournament was held at the Skyline Hotel, which is located at W50th St. and 10th Ave. I think it was a good location and pretty accessible. We used the penthouse for the tournament and it was spacious enough for 10 tables. There was 1 automatic table and 2 folding mahjong tables. The rest were folding tables with Junk Mats. Overall the playing experience was fine. The restaurant attached to the Skyline, however, was not. As part of the registration fee, lunch at the TexMex restaurant downstairs was included. The restaurant had really bad service; the waiter forgot our orders. 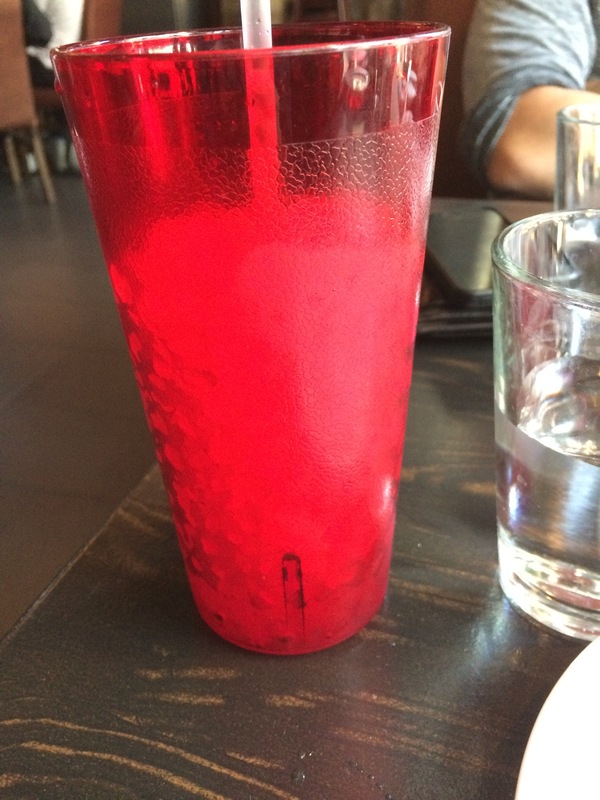 The food took forever to come, and the drink I ordered had about 80% ice (literally). But hey, I was there to play mahjong not eat food. Would you like some Sprite with you ice? Leading up to the tournament, I really had no idea what the format would be. There was little transparency on the part of the USPML to release the tournament details. All I knew was that there would be 8 hanchans and WRC rules would be used. It was only when I got there that the format was explained. Eight hanchans would be played where each player began at 25,000 points and with uma of +15,+5,-5,-15 in a time limit of 1 hour and 15 minutes. At 15 minutes left, tables which had not started were instructed to play only 1 more hand while tables in progress at the time were told to finish the hand and play one more. After the first 6 hanchans, the top 8 players would be decided. 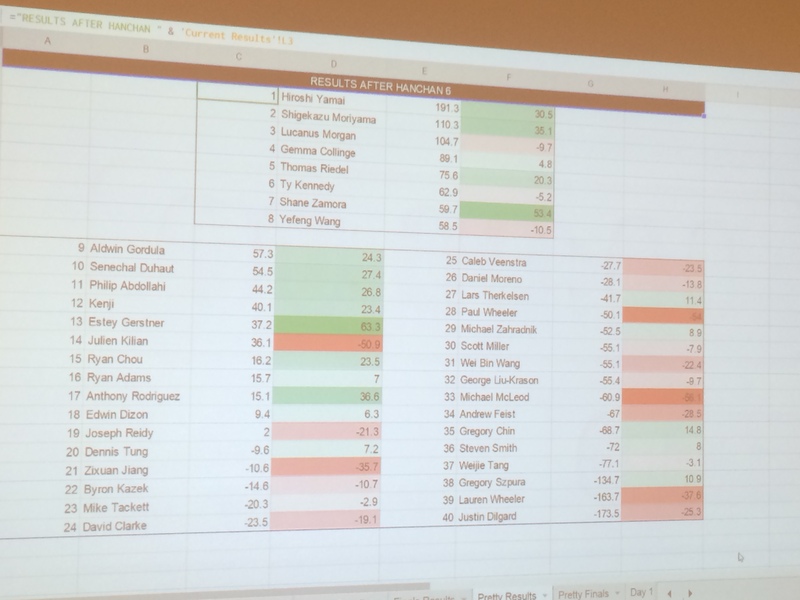 After that no one could advance to the top 8 and all scores were halved. The top 8 played 2 hanchans amongst themselves: the first to decide the top 4 and places 5-8 and the second to settle ranks within 1-4 and 5-8. The other 32 players then played 2 more hanchans as before with their halved scores. I’m not sure for the reason for halved scores, but it allowed for a lot of mobility in the rankings. The people who benefitted the most were people very negative while people who had good positive scores were most hurt by this. Out of 40 players, I would estimate that about a third of the players were “decent” (by my opinion). This is only an estimate because I did not play everyone. Nevertheless the rankings were very telling of who was good and who was not. I’m glad that I got to play with both Moriyama-pro and Yamai-pro (hanchans 1 and 6 respectively) in a competitive setting. I was very impressed by their plays. There were many players that were obviously novices. They had difficulty building their wall in a timely fashion and usually went for tanyao, yakuhai, or honitsu. In free play, I witnessed players drawing the wrong direction, noten riichi, furiten rons, and not even noticing a win. Luckily only 1 chonbo happened at a table that I was at. 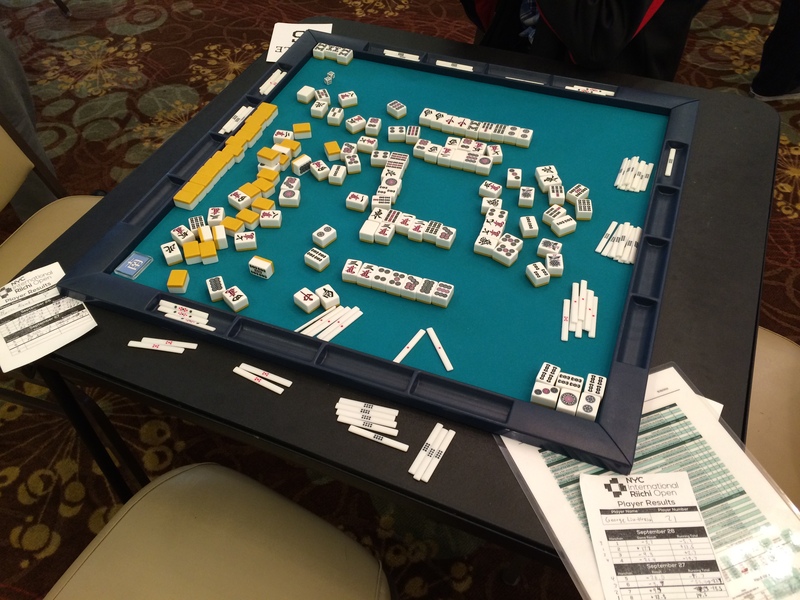 Although I wish the players were better, I realize that riichi mahjong is not very popular in the US and it takes events like this to help raise the level of players in the US. 1. Time Limit: One of the most common complaints that I encountered was the time not being enough. I only finished about half of my hanchans, and I had one hanchan where we did not even get to the south round. I think this comes from the fact that shuffling and building walls takes up a lot of time especially for the less experienced players. Also some players were quite talkative which slowed the pace of the game and many people took a lot of time thinking about their discards every turn. In the future, I hope to see a longer time limit (or none at all) or some sort of way to get players to play faster (more auto tables? 😉 ) Another reason why the time limit was problematic was that people who were seated north or west sometimes didn’t get their second dealership, reducing their chances to make a comeback or score more points. One hanchan I did not have time to make a comeback because 1 player kept winning 1 han hands in the east round and using up time. One way or another, this is the top issue that the USPML should address before the next tournament. 2. Chonbo: Although this didn’t happen much to me, many other players told me about chonbos that occurred at their tables. Chonbo is usually a mangan penalty (or some other point penalty), but here it was a ranking penalty of -20. Not only was this quite harsh, but also it wasted a lot of time. When a chonbo happened at my table, it was the 2nd to last hand to be played (due to time) and thus I lost 1 round of play. I was especially frustrated because I was in last by only a few thousand points. One player reported to me that 2 chonbos happened at a table he was at. While the other players should not directly benefit from a chonbo as in the case of a point penalty, they are hurt by the time wasted and the potential hand they could have had. For example, suppose a player declares riichi and then does a furiten ron. The other players lose out on a potential hand they could have won as well as time. Since this is linked with the time issue, I believe that this is high priority to be revised. 3. Player Matchups: There were some conspiracy theories about the matchups in the first 6 hanchans being rigged in favor of certain players. I am not making accusations but for example Yamai-pro and Moriyama-pro did not face each other in the tournament until the finals. To avoid potential accusations or such claims, I think that the matchups should have been posted beforehand so that is does not seem like a pro was purposefully put at a table with 3 players of ranks of 30+ (which occurred in my 6th hanchan). If there were a seeding and elimination system, I think people would have no problem with better players having it easier in the early rounds. The matchup system should be more transparent, and I think the way to do that is to show all the matchups beforehand as well as an explanation of how they were determined (i.e. the type of draw or randomization system). 4. More Females: This may be a personal wish of mine, but it’s apparent that the mahjong community is dominated by men. This fact was made even more clear to me when I played in the tournament. It felt like I was in a Fukumoto manga. One day I hope that the mahjong community (and competitive scene) have a more equal ratio of females and males. 5. The Stream: Hopefully there will be more streaming next year! This time there were some technical issues, so I think at most a recording was made. 1. First hanchan I played Moriyama-pro. I was quite nervous at the time, but East 1 I began to go for a manzy honitsu. Around the 9th turn or so, I noticed that Moriyama-pro, who was my kamicha, had caught on to me as he had not discarded a single manzu tile. Then he proceeded to call twice and then ron’d shimocha for mangan with his own manzu honitsu plus yakuhai. 2. Second hanchan I drew a tenpai with a shanpon on 3 sou and haku. One haku was out because I had passed on calling it. I immediately riichi’d. When I drew my next tile, I could feel the smooth face of a haku. Riichi, ippatsu, tsumo, san ankou, and haku. Haneman. 3. Third hanchan in East 1 I had a pair of west and a copy of all the other winds but was sitting north. I drew another east and called the first west and east when they came out. Then both a south and north were played. Then I drew both a south and a north. Shou Suu Shii guaranteed with a ryanmen as well. I was 1 shanten for a while until the dealer declared riichi and ron’d someone else. When he flipped the uradora indicator, it was a north. My yakuman died there. 4. Fifth hanchan in East 1 I was north again with a single west dora. I drew another one for a pair. Then I drew the third one. And then the fourth one. Right after I declared kan, the dealer riichi’d. With 4 dora I decided to not back down since I was 1 shanten. However I dealt in to a 7700 hand from the dealer. When he flipped over the uradora indicator, it was yet another south. My baiman died there. 6. Sixth hanchan I was playing against Yamai-pro. I didn’t expect to get first with him at the table, so I hoped for second. My expectation was confirmed when he ron’d toimen for a mangan East 1 thus ending my dealership. East 3 on the first turn, shimocha declared a double riichi! Then on the next turn a tsumo! Double riichi, ippatsu, tsumo, tanyao, pinfu. Haneman. My chance for 2nd place died there. 7. Seventh hanchan I had a good renchan East 1 with a 5800 and 3900 win. On the next hand, I got not only Suu Ankou 1 shanten but also a dora pair and a triplet of east. I pon’d a 6 pin from a 566p for tenpai on double ton, toi toi, dora 2/3 for dealer haneman. As I discarded the 5 pin, kamicha ron’d me for a tanyao. My renchan died there. Later on, toimen won 2 hanmans and a mangan. Thus my chance for first place also died there. 8. Eighth hanchan was where I hit it big. The wins in the East round were small hands. It all began South 1 when the dora was chun and kamicha declared riichi. With 2 calls already and a live chun in my hand, I tried to bail. A few turns later, I drew a second chun for 1 shanten. Suddenly toimen said, “If it passes, riichi!” and played a chun. I pon’d the chun for a 3,6 man wait which shimocha played a turn later. Next round I was dealer and the dora was haku. As I drew my haipai, I saw not only a pair of east but also a pair of haku. After ponning both east and haku, I went for a honitsu hand. In the last go around, I drew my tenpai on 1,8 pin with one 1p already discarded. I didn’t think it would come out late in the game especially since I had just played my first pin tile the 9p. However on the 2nd to last tile, kamicha played the 1p. Ron. Honitsu, ton, haku, dora 3. Haneman which made kamicha go negative. Every round after that I always had dora in my hand, though I didn’t win all those hands. South 4 I had 1 shanten for ittsuu with 2 dora and an ankou. I prematurely called the 3p for a tenpai on 3,6p but only the 6p would give me yaku. The dealer had already played one 6p and suddenly played the dora (4s). I pon’d and discarded a 3m. A turn later the dealer played a 6p. Ron. Ittsuu, dora 3, mangan. Finally I finished a hanchan with over 30,000 points. I finished the tournament on a high note. I destroyed the final hanchan with all my dora! Whew that was long. I had a lot to say because the tournament really inspired me as a player and I had a fun time meeting and playing with so many cool individuals. 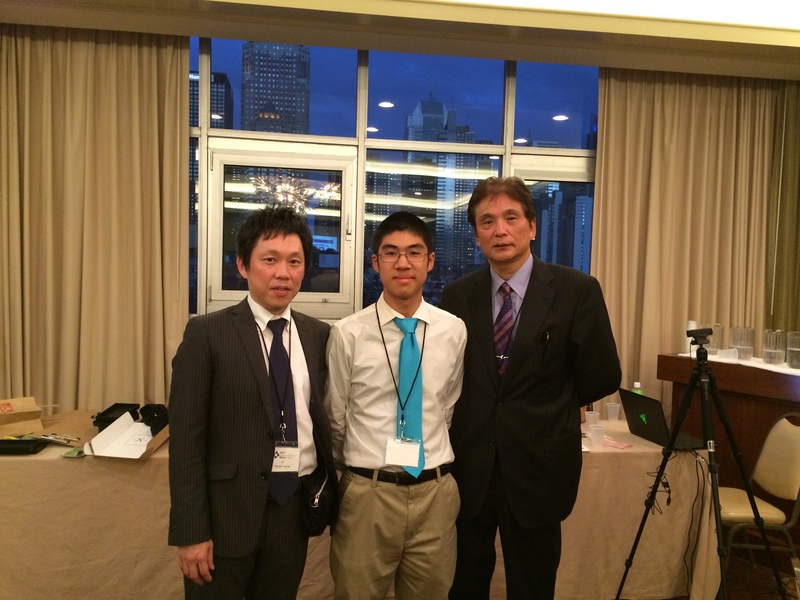 Thank you to the USPML for organizing the tournament and thank you to Mr. Moriyama and Mr. Yamai attending the tournament. ありがとうございました! As always, thanks for reading and see you at the next one! Categories: IRL | Tags: in real life, IRL, Japanese mahjong, Kokushi Musou, mahjong, Reach Mahjong, riichi mahjong, uspml, Yakuman | Permalink. This post is another update. This summer I finally made it to 4 Dan and 5 Dan. However it was only after playing as 5 Dan for a while that I achieved a >R1800. 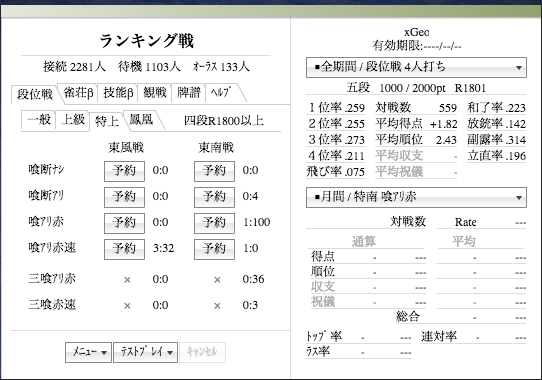 But I finally am eligible (barely) to play in tokujou! That’s right. 1801>1800 Hopefully I can continue to go higher! 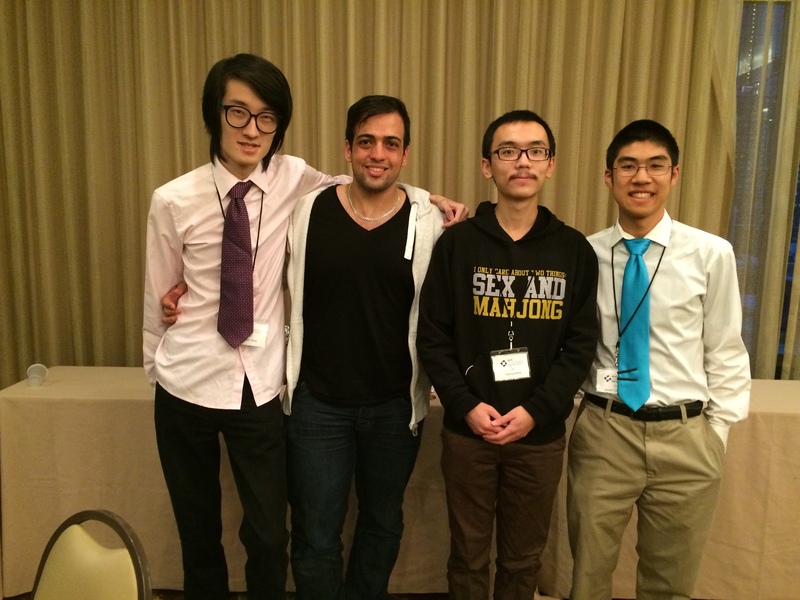 In a few weeks, the USPML will be hosting the NYC International Riichi Open. (More info at nariichi.org) I have registered and will be in attendance representing the USA. Supposedly players from all the world (including some Japanese pros) will battle it out over 8 hanchans in 1 weekend. This is my first tournament ever, so I am really excited. Lastly as always I am chipping away at the how to play mahjong. I realize that there are now more places online to learn riichi rules, but I’ll still work on phrasing the rules in my own words based on my own teaching experience. I’m also thinking of adding a yaku section, but that will come later. Or I may also do a series of posts on each yaku in the future. We’ll see. Categories: Uncategorized | Tags: Japanese mahjong, mahjong, Reach Mahjong, riichi mahjong, Tenhou, update, uspml | Permalink.